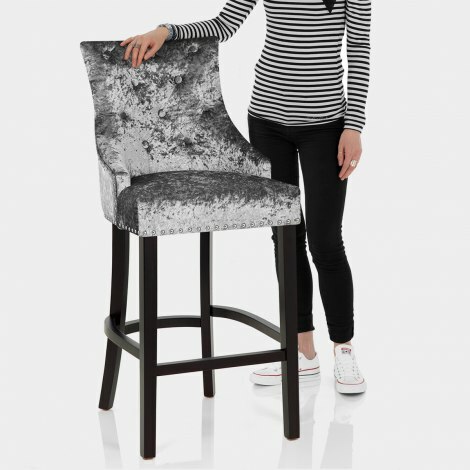 Enhance your bar area with the Ascot Bar Stool Grey Velvet, a stunning statement piece with a real wow factor. A beautifully boutique style fixed at kitchen worktop height, the Ascot Bar Stool is completely chic and has new and updated grey velvet for October 2018. Chic grey crushed velvet upholsters a webbed seat pad to give you high quality comfort. Grand in its design, the high backrest displays quilted button detailing. Ornate chrome studs edge the seat and the rear boasts a stylish chrome ring for a deluxe look. Set on a solid wood frame with a fashionable dark wenge finish, four strong legs and a footrest offer support and stability. This is complete with protective feet plugs to preserve flooring. "They look great and are so comfortable"
What a lovely product! We brought the bar stools to finish off our kitchen for seating around our island and they are really beautiful stools. Strong , well made and very good quality. The finish of the material seat part is very good. They are very comfortable as well. I am so pleased. Beautiful bar stools, very elegant, easy to put together and look stunning. I have loved these bar stools for ages and knew the second i moved into my new house they would look fab in my kitchen, And they didn't disappoint they are a real statement. I will be buying the ascot dining chairs to match in the near future. Excellent service. Arrived promptly. Excellent quality and look stunning in my nearly designed kitchen. Would highly recommend goods and company.